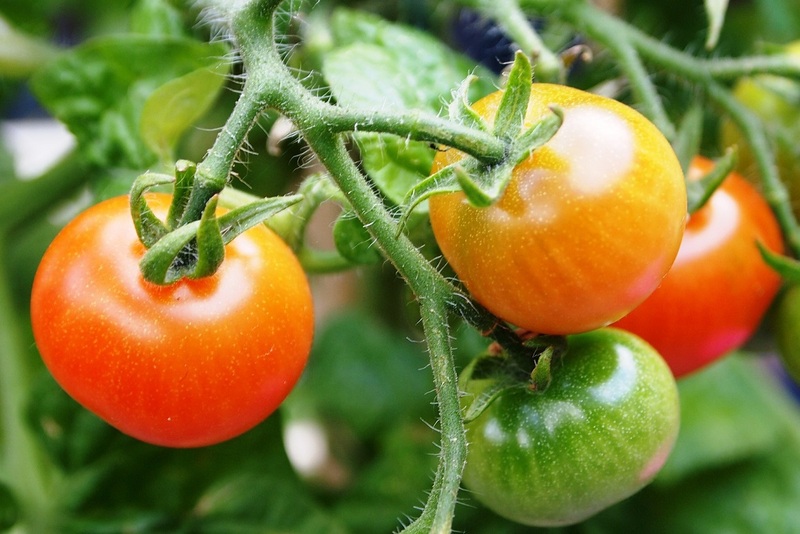 Tomato plants can be affected by numerous plant diseases, caused by fungi, bacteria and viruses. Pests that can transmit the disease. Some of the most common fungal disease are described here below. 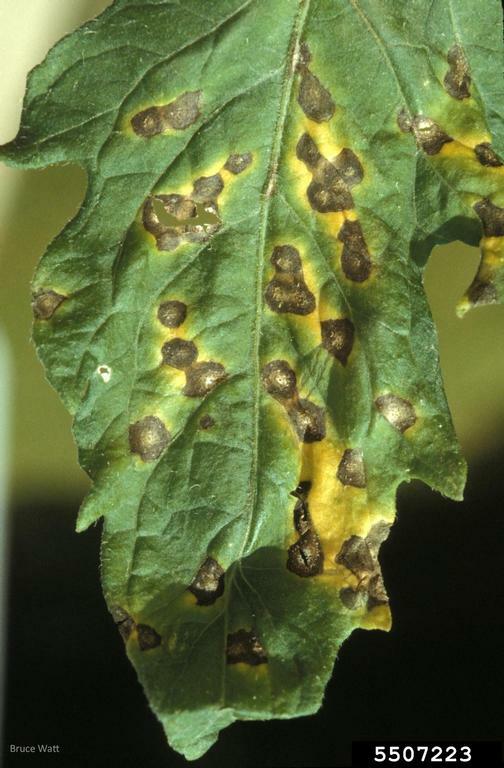 The disease is caused by the fungus Alternaria solani. 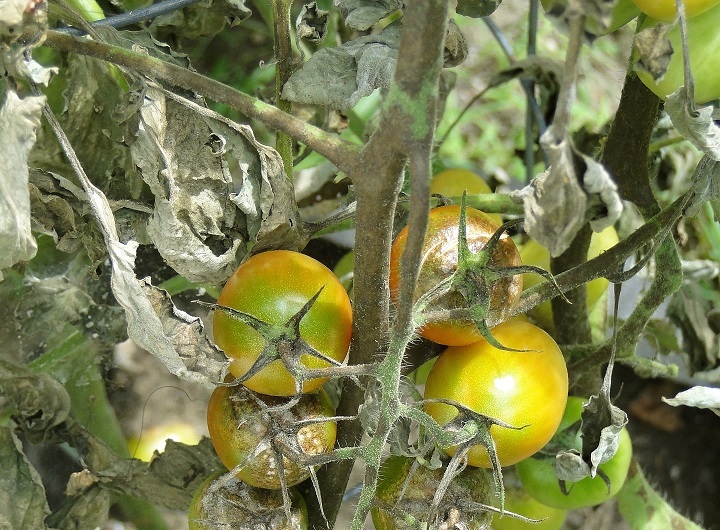 Early blight can affect leaves, stems and fruits of tomato. It starts with brown round spots on older leaves. The larger spots typically have target-like concentric rings and are often surrounded by yellow halo. Spots may merge together. Stems and fruits can also be infected, at a later stage of the disease development, as dark spots and cankers, having the target-like concentric circles may appear near the stem scar of the fruit. Symptoms can be easily confused with symptoms of Corynespora cassiicola. The disease can result in heave defoliation of the tomato plant and to heavy losses of tomato yield. Favorable conditions for early blight development – high humidity and temperatures above 75°F (24°C). The disease is caused by the fungus Phytophthora infestans. 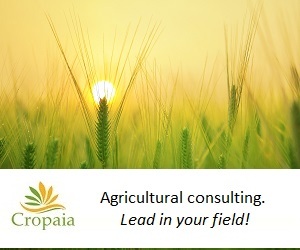 The disease can be devastating to the crop and destroy it within a few days. Symptoms first appear on the leaves, but all above-ground part of the tomato plant can be affected. Lesions begin as small, water-soaked spots, which develop to dark-green or black-brown lesions. When humidity is high, a gray/white fungal growth may appears on the bottom side of the leaves. When the disease progresses, tomato leaves curl, shrivel, turn brown and die. Dark lesions may develop on petioles and stems, as well as on fruits. They can eventually cover the whole tomato fruit. In order to survive, Phytophthora infestans needs live tissue, however it is not transmitted with seeds. Infestation is usually a result of spores carried by wind or infected tomato transplants. High humidity and cool-moderate temperatures favor the disease. The disease does not develop when temperatures are higher than 86 F (30°C). Caused by the fungus Septoria lycopersici. Symptoms are most likely to appear on lower leaves of the tomato plant. First symptoms are small, water-soaked spots. The spots enlarge, but still remain relatively small, and become angular. While the center of the spot becomes gray or tan, they may be surrounded with a defined dark border. Tiny black dots, which are the fruiting bodies of the fungus may be seen inside the lesions. Spots may coalesce and leaves may become entirely brown and die. The fungus can survive in infected tomato debris. Prolonged periods of high humidity and warm temperatures provide ideal conditions for the spread of the disease. Caused by the fungus Verticillium dahliae. The disease is soil-borne and penetrates tomato plants through their roots. It blocks the water transport system of the plant, and therefore causes wilting. Early symptoms include yellowing of older leaves and wilting of individual plants or parts of the plant. Yellowing has a V-like shape, as it narrows from the leaf margin inwards. Cutting the stem open, to its length, reveals dark streaks along the water transport system. In verticillium wilt infection, the dark streaks inside the stem are in the lower part of the stem, near to the soil surface.